Design is a conversation between designer and user. How effective this conversation can happen; is depends on the conceptual model of the designer for the product. Designer does not interact directly with user. Designer only talk to the user via product. Imagine a scenario you have never seen a kindle device or iPad, and you have been handed one to read a book. You have a mental model in your mind already, what reading a book will be like on a kindle device. This mental model is built from the past experience, knowledge or common sense. Conceptual model of designer need to match with mental models. 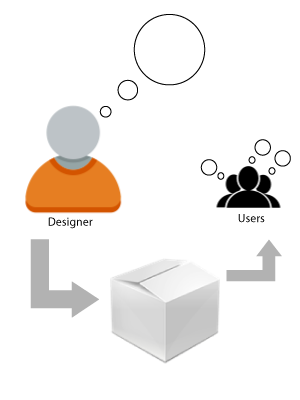 Designer design a product using his own conceptual model about the product. Here conceptual model is an explanation, how something works. But different people may have different mental model about the same product. No matter, how great the product is, if people cannot use it, people will not buy it. Designer needs to match his conceptual model with the mental model of different users. Tool like personas and scenarios plays a vital role to understand the mental model of users. Designer should not design for one mental model as different users use product differently. What if, mental model is not matching with the conceptual model of designer? Imagine a scenario, a user has made online purchase many times and thus have certain expectations and mental model about how the checkout process should be. If the checkout process is not matching with that mental model, user will be confused and get nervous that can set a negative experience. Thus, money will be snatched from the table because mental model is not matching with the conceptual model. Explanation with that sketch was great. Previous Previous post: Usability testing with blind users – How blind users work with web sites ?